The Mega Man series is iconic for its amazing stages of perilous platforming, shooting enemies with your arm cannon, stealing weapons from the robot masters, and using them as another’s weakness! The unique trait about the Mega Man series was that you could pick which stage started with, and do the robot master stages in any order! Each robot master has a stage you have to complete, and at the end, you fight the robot master. Some are super easy to beat, and others are downright impossible! (That’s why you use their weakness). 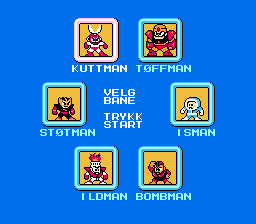 After you defeat all the robot masters, it’s on to the Wily stages! The main enemy of the game is Dr. Albert Wily. 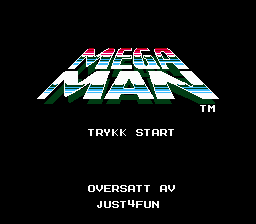 Here is a full translation of Mega Man in Norwegian.